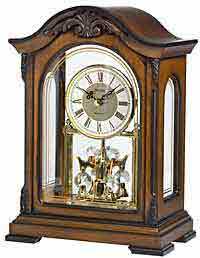 Large Bulova B1511 Thomaston Chiming Mantel Clock in a dark brown cherry finish on a hardwood case with front glass dial. Bracket style design with a brushed metal dial with cast,applied corner spandrals. Roman numeral dial and metal filigree hands. Decorative, scalloped base and sides. Protective glass lens and cast metal "carriage" handle. Bulova Harmonic triple-chime movement plays choice of Westminster, Ave Maria or Bim-Bam melody on the hour. Quarter-hour Westminster chime and hour count available. Adjustable volume control. Automatic night shut-off switch available. Brushed brass blank 3" by .1/2"engraving plate is included. Requires (1) AA (2) C batteries. Clocks for sale at The Clock Depot including the B1511-DS at discount prices.